Today, I have finally secured my exam permit for an entrance exam I will be taking next month. My cabin crew dreams are at stake and of course, I shall make sure that no matter what happens, I’ll make that dream come true. I’ve been easily distracted lately and haven’t really – seriously – studied. What I can say though is that the “normal” way students study doesn’t really work for me. I can’t be one of those who studies like there is no tomorrow. Probably because instead of my brain relaxing while studying, it gets pressured too much that I end up not absorbing everything? I cram study a lot and from experience, my brain actually copes up well with that kind of stress. It is like I absorb even more when I know I really need to understand whatever it is I’m reading. I’m still not decided what i should do. Given that it is a VERY long exam, I cannot just cram study last minute cause that will be suicidal. When I’ll start studying bit by bit.. I was thinking this Saturday or Monday next week. I still am not sure what I’m supposed to study! God knows how badly I want this. And that I’m willing to do whatever I need to for this. I have been trying to find a model plane of Emirates Airlines at a store in the mall but the salespeople said that the Emirates planes were sold out. I gave them my contact number and asked them to text me if they have already restocked. I was bathing awhile ago when I heard a sudden knock on the door. Confused as to why her knocks were loud, I asked her why. 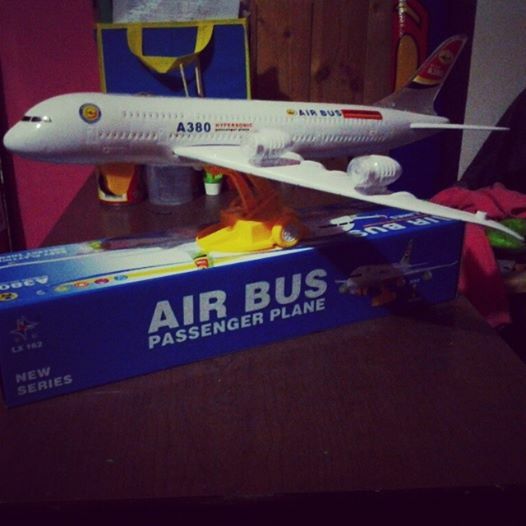 She said that my mom had a toy Airbus A380!! I readily finished bathing and got in my clothes then rushed going to them. As soon as I saw it, I claimed it as mine. My mom couldn’t do anything about it! Though it wasn’t exactly an Emirates plane, I found it beautiful. Also because of the plane, I remembered having an airplane before!! I used to play barbies a lot and even my mom had this habit of buying and buying things for the barbies. 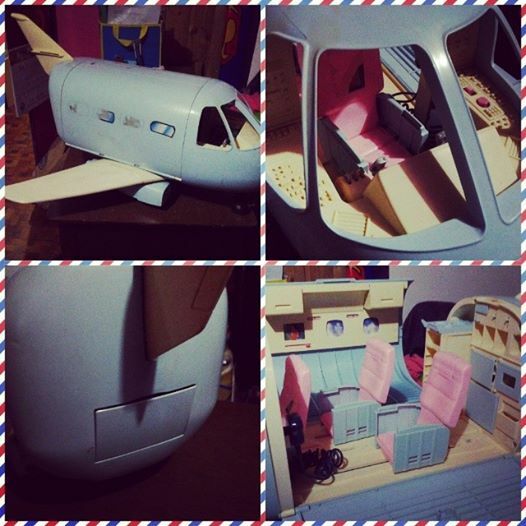 Houses, beds, swimming pool, a lot of clothes & shoes and a plane — name it! Because of the planes, I was thinking if I should start collecting airplane models. Yes, it was not 100% complete as before. The small trinkets like the sodas for the food and beverage cart were nowhere to be found. Luckily, the mini microphone was still working! I can imagine myself practicing flight safety procedures while using it. Please don’t laugh at me. Before you advise me to go see a shrink, I shall end this post right now. Just recently, I started reading my horoscope everyday. For random advice, tips and also as a guide for my everyday. Also, my horoscope has been helping me rebuild myself. Every time I read my them, they are surprisingly aligned with what my dilemma is lately. It feels like the horoscope was made for me personally! This is my horoscope today c/o an app from the play store. You have never been one to push against what seems like fate. If you make an attempt at something you want and it doesn’t seem to want to work out, you usually feel it is best to retreat. That’s not to say that you aren’t ambitious, because you are. But you just don’t get the benefit of pushing and pushing against what seems like a brick wall. But right now, Capricorn, there is an opportunity that looks – for all intents and purposes – like a brick wall. But that wall may have weaknesses you will only discover if you keep pushing. My attitude has been like this for God knows how long. Retreating because of something not working out and feeling that it happened because it really is not meant for me? Why did I need to read it from my horoscope just to realize it? Actually that is an understatement. I have a lot of dreams I want to achieve in life but the thing is.. I am too scared to chase my dreams. From my personal research, I have read that they only have one agency here in the Philippines who recruits their employees. They haven’t really conducted an open day recruitment for the said airline. Still hoping that they recruit by the time I graduate, I will still strive for being my best soon-to-be-a-cabin-crew-self. Chances are, if they really don’t recruit here by the time I graduate and I have saved enough money for an extra travel, I might attend an open day recruitment at one of the nearby South East Asian country. I don’t think there is anything that I can’t do for my dream airline. As I was again researching about Emirates Airlines, I came across this.. It made me want my own in-flight proposal!! Though it was just simple, the thought of it being on air makes it special! The guy wasn’t embarrassed at all to profess his love in front of people they both didn’t even know. Today, I started with my law of attraction. What would I like to attract? Even though I have been talking about it on my last few posts, I will still explain it a bit. I would like to shift courses. From Marketing Management, when I pass the entrance exam, I will be under a Tourism Management program instead. This is so because I realized just a few days back what and where I would really like to see myself someday.. and that is being a cabin crew for an international airline. My law of attraction basically involves researching about the industry, my dream company *Emirates Airlines*, cabin crew tips, interview questions and cabin crew testimonies. I have just started today but I’ve already learned a lot. Also, I gained a deeper understanding about what a cabin crew really is. What other people can see are only the glitz and glamour of the job but it is more than that. The cabin crew are not just there for display. They are the ones responsible for everyone on the plane. They serve and think of everyone before themselves. To be a cabin crew, you have to be selfless, alert, kind in every way and most of all, patient. For all the testimonies I’ve read, I know that I still have a long way to go before I can be the best flight attendant I can be. One thing I can assure myself though is that I will not stop until I reach my dream and not only be a better cabin crew but also a better individual. Since I’ve decided that I will push through with taking an entrance examination so that I can study Tourism, I wanted an inspiration. After researching and checking out different airlines, there was one that really stood out for me. It is no other than Emirates Airlines. Aside from their crew being multi-cultural, the numerous blogs and websites that I’ve read highlighted how great their crew training is. Yes, it scares me a bit but I know that if given a chance, I’d readily grab it and train as hard as I can to be the best cabin crew I can be. I am 100% sure that I will take the opportunity. They even have the best facilities that make their training seem real! For now though, Emirates Airlines will serve as an inspiration for me to better myself in this new endeavor I’m about to face. I’ll throw away all the shyness in me and release my stronger self. I will do my best at the university I’m about to attend and will participate at organizations so that I will be trained well. I want to beef up my resume so that when I graduate, Emirates Airlines will notice me and I’ll hopefully be given a chance to be part of their cabin crew. For now, I still am not sure if they are accepting interns from the Philippines. When I need a company for my internship though, I hope they do. I’ve been reading and reading about being a cabin crew at their airline and it excites me more every time! I can guarantee that this won’t be the last time I’ll be writing about Emirates Airlines.